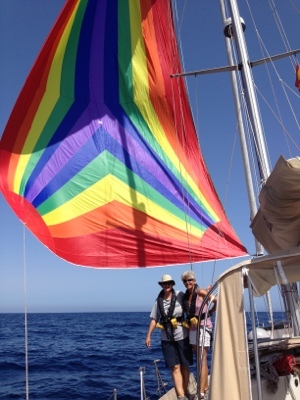 We left Gibraltar at lunchtime on Monday for our epic sail to the Balearics 400 miles away. The first day was a great sail with a lot of swell still but by early Tuesday morning the wind has died so the motor came on until the afternoon sea breeze kicked in around 2pm. The second afternoon brought light winds with only a small swell so out came the rainbow cruising chute. We managed over 6 knots with less than 10 knots of wind. Looked amazing. With three experienced sailors on board we could implement a three hours on, six hours off watch system during the night so only one person was on watch at a time with Jase buddying up with Lee as it was his first long voyage and night sail. We soon got into a routine and the second night was uneventful until 9am on Weds morning when we were motoring (light winds again) and a horrible noise came from underneath the boat. We immediately put the engine into neutral as it sounded like we had caught something around our propeller. So, the time had come for Jo to don the wetsuit she had bought in Brest and find out what had happened. It was a large piece of plastic that looked like it had been in the sea a long time. Just as she was about to go back under and cut it free, it floated free and all was well again. We had to motor again until the afternoon and the chute came out again and we were making over 7 knots until dusk. Each morning we were greeted by several dolphins and even saw a sea turtle. Whilst Liz hasn’t managed to catch any fish yet, a squid did get washed up into the deck. We didn’t know how long it had been dead so threw it back to the sea. 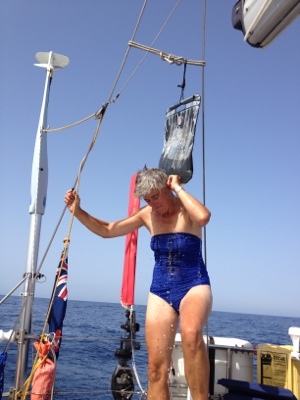 Liz managed to have a shower on deck when we were 50 nm from land and 1000 m below us! We arrived in Formentera at 11am on Thursday morning and anchored in a small bay called Calo de Sant Agusti where the water is turquoise and warm. Checking the anchor had set properly was very easy as the water is so clear. We had a leisurely lunch, several swims and then headed off to shore where there are several bars and restaurants as well as a well stocked supermarket. They even provide a free disco on the beach so the rest of the evening’s entertainment has been provided! This entry was posted in News and tagged 2012, Balearics, Spain. Bookmark the permalink. 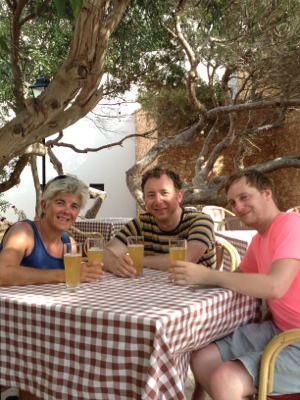 All sounds wonderful-Enjoy it.Gordon is back to Spain on Monday He cant wait!!! !